Collecting and storing device data, performing analytics, and creating purpose driven dashboards. Reducing project risks through effective management and professional competence in all things automation. Providing high-quality/low-cost control and electrical panels to end-users, OEMs, and contractors around the world. Our engineering staff is purposely diverse in their respective formal training (degrees) and work experience. DST's technical roster includes electrical engineers, mechanical engineers, control engineers, chemical engineers, computer science engineers, and our "trained-in-the-trenches" engineering technicians. DST professionals are skilled at increasing the availability and visibility of real-time production data so managers and executives can make more informed decisions. 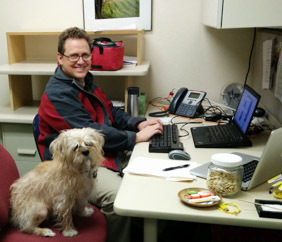 DST’ers enjoy a dog-friendly relaxed working environment where working hard and having fun are both expected. We stress career and skill development where learning to be organized and focused are keys to success. Everyone that works at DST must be willing to learn every-day and help others. We believe a team environment is necessary for our success. Our company is our employees; they are valued above all else. Providing design and controls integration across many industries. 14,000 sq-ft. manufacturing facility supports two distinct offers.